Most people have a pretty clear idea of what goes into a landfill. Smelly stuff. Lots and lots of smelly stuff. But thanks to new technologies and some very innovative engineering, some pretty smelly stuff is coming out of the Carbon Limestone Landfill as well. In a remarkable act of recycling, Allied Waste has developed a method of collecting smelly garbage, capturing the mega-smelly methane gas that results from its decomposition, and turning it into energy. Across approximately 340 acres of the facility are 200 methane extraction wells. A pressure vacuum collects the gas, which is then burned utilizing $1 million engines to produce enough electricity to power 15,000 homes per day. 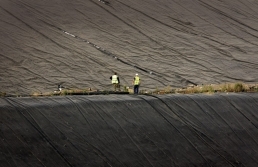 To make sure that nothing leaves the landfill that shouldn’t, they employ the Best Available Technology liner system and other environmental safeguards. It’s a smelly job, to be sure, but one that we’re honored to be involved with.